He kicks darckclaw into a tree and takes weasel to my house result twelve. I dunno. Somehow, this review did not make me all tingly and proud. Those of you who are familiar with Dover Beach will recall that it contains no weasels, and probably very few trees. My publisher says I should respond to all my customer reviews, but I can’t figure out how to respond to Barnes & Noble reviews. If I could respond, what should I say? Thanks for the insightful comments! Somehow, you have intuited deeper truths about my novel than even I have heretofore recognized. For that, I will be forever grateful! Does that work? By the way, I Googled Darkclaw and found out that he is a character in Brian Jacques’s Redwall books, which my kids liked once upon a time. I never thought they went anywhere, but I wasn’t a kid when I read them. This is an incredibly good book. Clearly, the absolute best post apocalyptic detective novel I’ve ever read. I want more, Richard Bowker. More! That’s more like it. On the other hand, I was unaware that there are more post-apocalyptic detective novels out there. That’s a little discouraging. I thought I had cornered the market! Authors are hard to please. 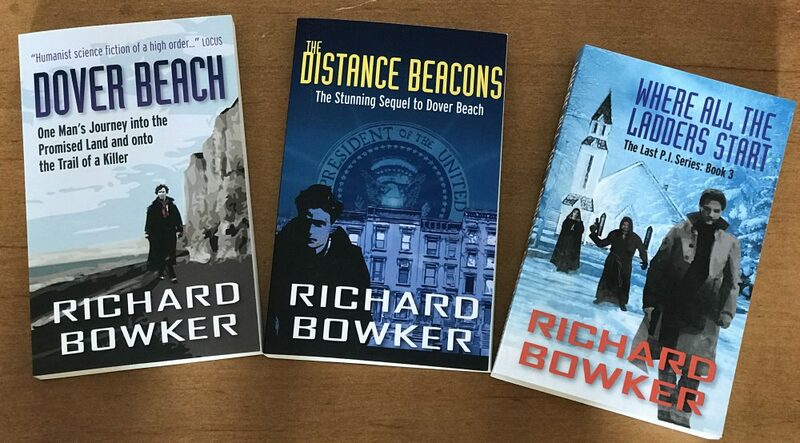 This entry was posted in Ebooks and tagged authors, book reviews, Dover Beach, ebooks, Nook, novels, science fiction by Richard Bowker. Bookmark the permalink.